I’ve read that the average toddler hears the word ‘no’ 400 times per day, and I may be on pace to break that average wide open before my son hits the ripe old age of two. But the instinctual ‘no’ at home and the appropriate ‘yes’ in business hasn’t crossed paths…just yet. Everyone is guilty of it. EVERYONE. The shoot-from-the-hip ‘yes’ answer to a client or prospect because we are so eager to please, or so anxious to close the next big account. Who does that ‘yes’ really hurt in the end. That answer again is…EVERYONE. It’s a classic theme heard over and over again, “The customer is always right”. And in today’s economy who can afford to say ‘no’? Now don’t go out tomorrow and begin slapping hands and shouting ‘no’ to every misbehaved customer you come across, that’s not what this is about. It’s less about the answers and more about the questions that YOU are asking. Many years ago as a very young and eager Account Manager I learned what to this day may have been one of the most valuable lessons in my short but fruitful career: “give the customer what he/she needs, not what they want”. While it’s easier said than done in a world filled with ‘yes’s’ it may be a theory that is still ahead of its time. Provider: No problemo! Overtime here we come. Client: I need you to build me a report that captures criteria A – Z. Provider: What are you specifically using this report for? Client: My CFO needs to know why we’re spending so much capital on widgets that we end up tossing at the end of the year. Provider: So it’s not that you need tons of data, but instead a report built to capture usage of an X time range? Maybe include an algorithm for forecasting? How many emails do you receive from marketing and sales reps and quickly mark them as junk mail? I must get 20+ non-personalized, flashy emails every day that I delete without reading. ​Once a prospect marks an email as junk you won’t be able to reach them again, closing off a marketer’s most significant strategy. That’s why it’s important to have a multi-channel marketing program, not just email or junk mail materials, but a marketing partner with tools to manage several channels, producing personalized content. Google “blind RFP sales strategies” and you most likely won’t find much in the way of helpful information. Why? Because truly blind RFP’s have become one of the most dreaded topics in sales, not to mention the fact that there really is no strategy one can employ behind it. Call it fool’s gold, a beauty contest, a cattle call, a bake-off, just don’t call it a productive way to spend your time. In the age where a supplier’s information is readily available at the click of a mouse, no longer do buyers need to be “pitched” a product or solution. Fact is today's business buyers do not contact suppliers directly until 57% of their purchase process is complete. The blind RFP is so taboo most sales professionals don’t want to write about it or address the issue head on for fear that they might not be included in the next “opportunity". I’m always amazed at the level of commoditization buyers and professional purchasing organizations have whittled what would otherwise be typically both a very complex solution and a rather expensive one; typically in the hundreds of thousands of dollars. I most certainly wouldn't shop for a home or car in the same way. Yet here we are – sales and procurement in a head to head standoff – fighting over price. Sales professionals kept at arm’s length from the end users, left to fill out a spread sheet with their “best price” only to be compared side by side with another vendor. More and more sales professionals are finding themselves at the cross roads of deciding whether or not to respond to these bake-offs – yet a majority of them still do. RFP’s can be tremendously time consuming for an organization, time better spent prospecting an opportunity they actually have a chance at winning. The fact is, when a blind RFP has been issued 97% of the time a decision has already been made. And don’t be fooled by the 3% chance you have at winning either. RFP’s typically consist of anywhere between 3 – 8 participants with the average being 5. By the numbers that only leaves you with a .006% chance of winning. 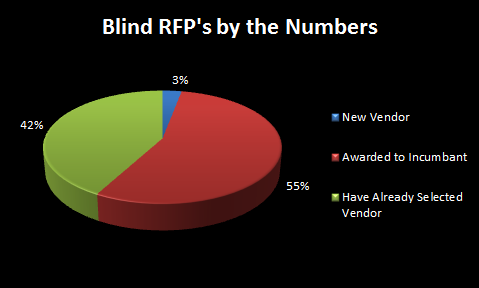 I have participated in 100’s of blind RFP’s in over 15 years of selling and have yet to win one. In fact, as I surveyed several other peers in my industry their “luck” wasn't any better. My advice is simple, the next time a truly blind RFP ends up on your desk proceed with caution and remember what your odds really are of winning. Instead, use your prospecting time wisely to get into an opportunity early and you’ll find yourself in the driver’s seat of the conversation. We help small businesses create an affordable marketing strategy.